Wool fiber cotton seeds, sliced and weakly interrelated. There are 4 varieties of cotton: hygroscopic eye, hygroscopic clinical surgical sterilized and non-sterilized, absorbent hygienic household sterilized and non-sterilized, compress. Absorbent cotton, i.e. whether (boiled in alkaline solution) and bleached, has a good absorption (absorbs water and dries quickly), is used when bandaging wounds (covered with a gauze), injections and infusions (in the form of balls rubbing the skin with alcohol or ether). 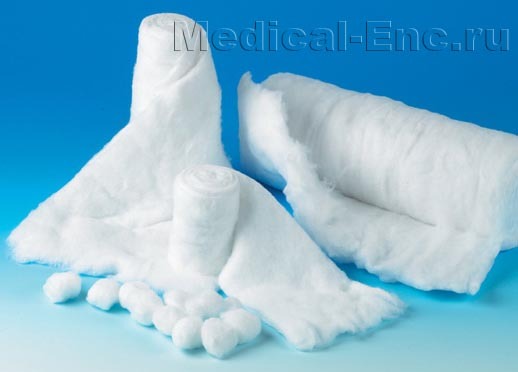 Compress wool (not fat), more magnificent, elastic, used for hot compresses and as a lining at imposing tire and plaster bandages. In medicine wool used as dressing material, sterilized by the General rules of sterilization (see). Vata lower grades and garment, furniture - dark or variegated colors are not valid for use in medical practice, as may be the source of infection.